Adolescence is a time of confusion and contradictions for teens and parents alike. Dozens of organizations are devoted to the problems of dysfunctional families and adolescents…as they should be. But few resources are available for parents struggling to proactively deal with the everyday problems of raising teenagers. 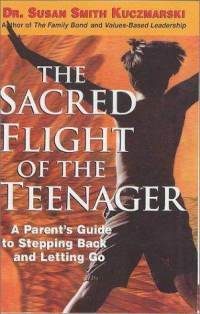 The Sacred Flight of the Teenager provides the gentle, yet enthusiastic support parents need to help their teenagers develop strength, become independent, and grow into responsible adults. This book gives its profound insights and down-to-earth tools in short, easy-to-read vignettes that illuminate the “sacred flight”—the life journey every child takes through adolescence and into adulthood. Written with kindliness, empathy, and good humor, in prose that speaks to the heart and gets to the heart of the matter, The Sacred Flight of the Teenager will be a wise an supportive guide to every parent who reads it. “Well-written in an easy-going, readable tone that communicates well with parents, this book is an encouraging, supportive guide to help parents step back." “I give this book rave reviews. It’s rich with humor and sensitivity, empathy and understanding."